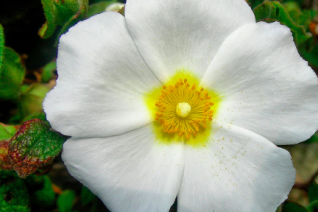 Enormous white flowers are incredible while they are born from May to July on this classic rockrose. Resinous, deep green foliage is fragrant, especially as the temperature climbs. 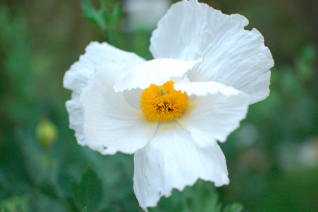 The 4″ wide pure white flowers that appear daily remind many of Romneya coulteri Matilija Poppy. To 4′ x 4′ in 5 years for full sun and well drained soil with light summer water. Extremely showy in bloom. Moderate deer resistance. 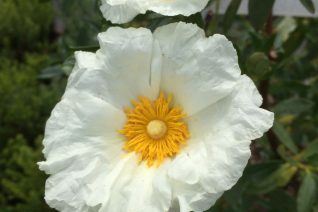 Low growing shrub that is also one of the hardiest Cistus to cold. To 2′ tall and 3′ wide in 4 years. Large bright rose colored flowers appear for an extended time in late spring to early summer. The crinkly gray green foliage is dense and good looking year round. Full sun and sharp drainage. Excellent bank cover or shrub for a hell strip. Light to little summer water when established. Forms a dense evergreen cover. 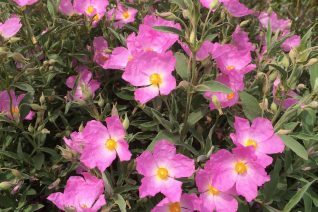 We’ve grown a LOT of pink flowered rockrose. This is our favorite by far and several important distinctions make that so. The large flowers are clear pink on the edges fading to near white around the boisterous orange/yellow center. 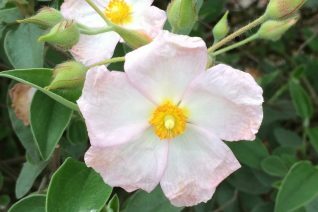 It blooms profusely and the elegant but subtle flower color virtually marries its gray leaved backdrop. Excellent. To 3′ x 4′ in 5 years ‘Jester’ exhibits great cold tolerance as well as drought adaptation. Full sun and well drained soil with little summer water once established. The large (3″) Pink flowers appear for 4-6 weeks in late spring. Fragrant foliage is waxy and could be unpalatable to deer. Long lived for this genus. 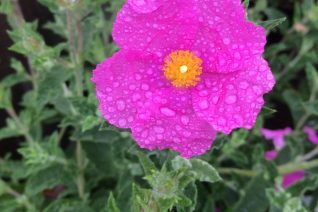 After growing a whole bunch of Cistus this variety has risen to the top. Upright growing deep green evergreen shrub to 5′ tall and 5′ wide. The thin deep green leaves have the sweet fragrance of balsam. 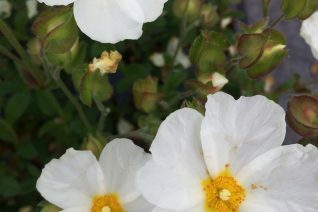 Beginning in May a constant procession of 3″ white flowers with a red basal blotch on each petal. Each flower lasts a day but there is a constant supply waiting in the wings. Full sun and average well drained soil. Tolerates clay soils well. If you give it a touch of supplemental summer water it will often extend the bloom season all the way until September. Exceptionally cold hardy. One of the finest rock roses. 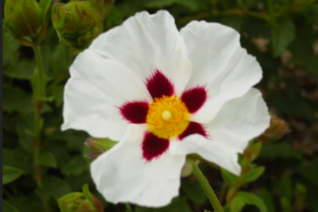 Compact white rockrose is a fantastic hybrid that gives this shrub several outstanding attributes. A dense compact habit heavily clothed in small deep green leaves. To just 3′ tall and 4′ wide forming a dome. This dense habit resists splitting in ice and snow. From May to July a massive constant procession of pure white flowers. Often bloom is so heavy that it obscures the foliage. Each flower lasts just a day but is replaced by a seemingly never ending supply. In autumn the spent flower calyxes turn bright orange red and are showy- especially when backlit by the sun. Great landscape shrub for hot sites in any well drained soil that does not become boggy. Avoid overly enriched soils for a more cold hardy and dense growing plant. Easy Cold hardy to near 5ºF. Little to no summer water. 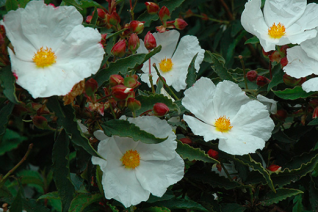 Rockrose are famous for the sweet balsam fragrance emitted from their foliage. The chemical ladanum is responsible and the heart shaped thick leaves of this hybrid are thick with it. 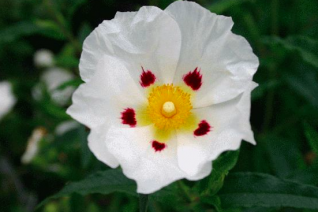 Hot days bring a wave of perfume from Cistus x pagei long after its profuse display of pale pale pink flowers. Very heavy bloomer. To 5’x 5′ in 5 years. Exceptionally hardy to cold and very very drought tolerant as well. Excellent low care shrub for rough areas. Full sun and well drained soil. Light summer water to establish. Moderate deer resistance.